You will be picked up from our office in Sultanahmet at 19.00 and your bus departure time will be at 20:30 you will have a night ride travel by bus to Cappodocia.You will be picked up from our office in Sultanahmet at 19.00 and your bus departure time will be at 20:30 you will have a night ride travel by bus to Cappodocia. 17:30 Your tour will finish and you will be dropped to your hotel.Overnight stay in your Boutiqstyle hotel. 09:15 You will be picked up from your hotel for the tour by us. 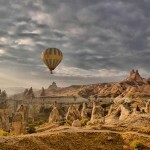 First place in the tour is Panoramic view of Goreme. You get information about history, formation of Cappadocia while watching the fairy chimneys in Göreme town. After driving about 40 minutes, arrival to Derinkuyu Underground City. This underground city was firstly, used by the late Romans as a shelter against potential Arabian invasions then used by local people as a natural deep freeze. Derinkuyu is the deepest underground city in the Cappadocia region. With the clear explanations of your guide you will spend almost 1 hour here. Ihlara Canyon is 52 km. away from Derinkuyu Underground City. Approximately 45 minutes later, you will be in the entrance of Ihlara Valley. Ihlara Valley was formed by the volcanic actions of Mt. Hasan and Mt. Melendiz in the distinct of Aksaray province. Afterwards, Melendiz River eroded the valley for millions of years besides the layers cracked and fell down. Eventually, 100 meter- deep canyon was composed. Whole Valley is 14 km. length. In the past, generally Christians came and made dwellings and churches with wall paintings and also they carved grave rooms in the several parts of the Valley. You will hike about 3,5 km of the valley. Hiking will last 1hour 15min. Then you will arrive to Restaurant for lunch in Belisirma village. 1 hour for the lunch in the valley, next to the River. You will start with the soup and salad, later you will able choose one of the main dishes from the list. Lunch will be over with season fruits. After lunch our guide will take you to a unique place, Yaprakhisar. You will see the nicest examples of conical fairy chimneys. Since the area is very similar to Star Wars Film Set, Yaprakhisar is known as “Star Wars Movie Set”. Our tour will go on with another movie- set-like place, Selime Monastery. At first glance the monastery looks like a castle, but shelters, churches, chapels, bedrooms, storages and big cathedral proves us its being a monastery. You get information about the monastic life in Cappadocia. Upon arrival to Pigeon Valley, pigeons will meet you on the top of the valley. 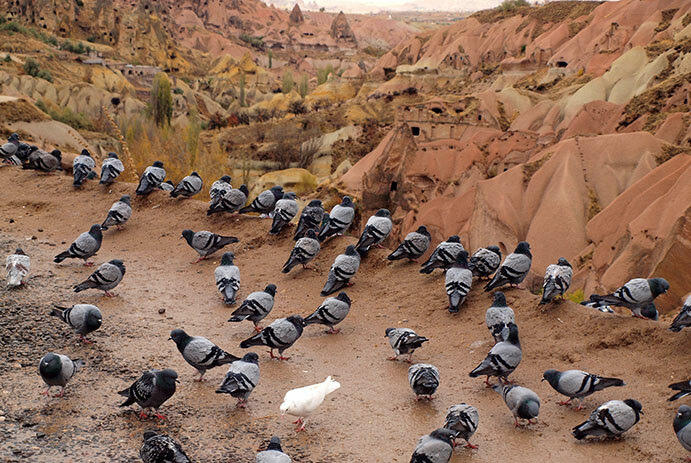 Pigeons have always been important for Cappadocian people. Their eggs and droppings were used for different purposes. For this reason, local people carved houses for them onto the slopes of valley. You will see the reason why people call them “houses”, when you see them. The Last place in the tour will be a visit to onyx factory in Uchisar. Onyx is a semi precious volcanic stone which has various colors and contains different minerals in. As being a volcanic area, Cappadocia has some onyx deposits especially around Hacıbektaş village. In the factory, a master will give you information about the steps of onyx shaping and you will watch a shaping show.